bdMinimapis a simple chat replacement. -Added easy move features, will add more in the future. Would it be possible to add a visual reminder when you got a calendar invite? Getting this error while doing old content (LBRS). Last edited by Aur0r4 : 08-11-18 at 04:28 PM. 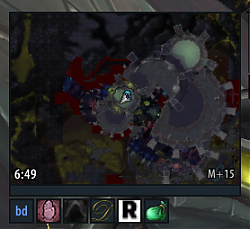 How do we disable the xp bar attached to the minimap? I did not see anyway to disable. There is an option to hide the EXP/Rep. Bar now. I would like to know if is possible to add an option to move the orderhall icon? Last edited by Aur0r4 : 08-11-18 at 06:19 AM. Recreataable, by logging in and out. Seems to fire upon logging inside game. Toggling the map to show the Auctioneer under the Townfolk submenu does not persist through sessions, and will revert to 'unchecked' after logging back in. Could you please add in an option to toggle off the garrison/class hall icon? So today I had to do a scan and repair as I was getting fatal errors that would crash wow. After doing so I log in and the mini map is a circle, the outline of the rectangle is there but I have a giant circle for a mini map. If I go into config and adjust the size or unlock and move it the rectangular map will pop into place but as soon as I reload all I get is a circle map with rectangular out line. I have tried with all add ons disabled and it still does it. Any ideas? How can I edit it so I will add those buttons too?